How Much Money Could You Make If You Got 100,000 Visitors or MORE to Your Website . . . Every Month? Whether you're looking to make money from your website, build a mailing list, or you simply want to enjoy all the opportunities that go with owning a popular website, it call comes down to how many visitors your website is getting. You may think getting 100,000 visitors a month isn't possible for you, but it is—and no experience or fancy tech skills are required! On Sunday, May 29, 2011 Dale Earnhardt Jr. took the white flag at the Coca Cola 500 and began the final lap of what looked to be his first tour win in over 100 races. He had a comfortable lead. The crowd was cheering wildly for the most popular driver on tour. At turn 1 the lead was 7 car lengths. By turn 2 the lead had increased to 8 car lengths. Victory was only half a mile away. While you may not be a professional race car driver, you have at least one thing in common with Dale Jr. ...you need fuel to win. As a website owner, your "fuel" is your website traffic. Visitors to your site are what gets the win for you, whether you're selling a product, promoting an affiliate offer, selling ad space, building a mailing list, or you simply want a popular site . . . it's the number of visitors your site gets that determine its success—and yours. Without fuel - website visitors - you don't cross the finish line. You don't collect the winner's check. You don't get the results you're working hard to achieve. You fall back in the pack while those with fuel left in the tank pass you by and take what could have been yours. Are You Disappointed With Your Website Traffic? Want To Learn How To "Fill Up Your Tank" With Visitors? If you want to make money online, or you want to build your mailing list, or make a name for yourself, or simply want a popular website . . . you need traffic. However you define success for your website, you need traffic to achieve it. The greater your goal, the more traffic you need. This is true no matter what business model you're using. You can't succeed unless you get lots of eyeballs to your website. You will not - cannot - succeed without traffic. But not just any traffic will do. You need targeted, responsive traffic. People who are interested in what you have to offer, because that's the traffic that converts to sales, subscribers, and fans of your site. More targeted traffic equals more of what you want. Nobody has to convince you that you need traffic, right? You understand that it's a numbers game ... the more people who come to your site, the more you prosper. The reason the "gurus" make a boatload of money is because they get a boatload of traffic to their sites. All else being equal, the one who gets the most traffic gets the most orders, the most subscribers, and so on. Preaching to the choir, right? You already know this. What you probably don't know is how to fuel up . . . in other words, how to get the maximum amount of traffic to your site with the minimum amount of effort and the least amount of money invested. 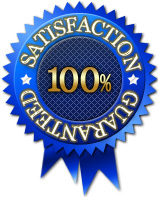 Most Profitable Traffic Strategies are 100% FREE! Tell me, how did you find this site? An ad in a newspaper or magazine? I'm sure you didn't because I've never advertised this site. You probably found it through a link at a search engine, or a link on some other website or blog, or maybe through someone's ezine. Point is, free traffic is practical and plentiful—if you know how to get it. Free Traffic Strategies that Don't Work are Worthless! Can you imagine putting charcoal into your car's tank instead of gasoline? Not every kind of fuel works. That's why you need to know which traffic strategies work and how to use them. Some of the most-talked-about free traffic strategies do NOT work. And, some of the traffic strategies many say don't work actually do work, if you know how to use them correctly. That's why you need to focus on the proven, time-tested strategies. These are the ones that work today and will work tomorrow. They're reliable, predictable, and profitable. Listen, I know some people don't believe that free traffic can be as good as or even better than paid traffic. It is. I use these same strategies every day, as do countless others. Almost one million visitors in the first four months of 2014! Rather than looking for temporary loopholes and places to spam links, Traffic Storm is about building traffic the right way. Traffic Storm is about Building Traffic Streams that Last! Now, I don't want to mislead you, it takes some time to build up that much traffic, but that's good news! Because it shows these traffic generation methods are not temporary loopholes that quickly get closed, but instead, these methods have long term effectiveness. And while you won't get hundreds of thousands of visitors a month right away, you will start increasing your traffic quickly by putting Traffic Storm strategies to use. Traffic Storm is Designed to Fit Your Comfort Zone! The entire Traffic Storm course is has 12 modules, with each module showing you a different way to get free traffic. Each module is a stand-alone unit, so you can buy just the modules that appeal to you, or grab them all at a steep discount. I do recommend you use more than one traffic generation method because you'll draw different people to your site with each method. F — Free. That means no worrying about spending your hard earned money to get visitors to your website. Why pay for traffic when you can get it for free—especially when the free traffic is a better long term strategy! Unlike ads or pay-per-click traffic that dries up as soon as you stop paying, free traffic just keeps on coming. U — Understandable. A traffic strategy is worthless if you don't know how to deploy it correctly. These deployment secrets are spelled out in an easy-to-understand language anyone can follow. E — Effective. The traffic isn't worth a penny to you if it doesn't produce results. That's why I only include the most effective, time-tested and proven strategies that work across all niches! L — Lasting. These strategies worked yesterday, they work today, and they'll work tomorrow, next month, next year and beyond. You'll discover methods of generating free traffic that continue to produce results long after you've set them up. It works that way for me, it will for you, too. That's right, these are the proven strategies. The ones that predictably work every single time. These are the strategies you'll wish you started using ages ago! You'll get your traffic-strategy reports instantly when you buy now so you can get started immediately! You'll finally get results. That's because this entire course is designed to give you the step-by-step focus you need to succeed! Each module is a stand-alone, meaty traffic manual that averages about 40 pages. There's no guesswork required, because you'll get detailed, crystal-clear instructions that tell you how to deploy and profit from these traffic strategies! You'll discover the TRUTH about free strategies. You'll know which ones work, and which ones you should ignore. No more chasing after "bright and shiny" traffic opportunities that fall flat! You'll get in-depth guidance on the "workhorse" strategies — these are the ones that predictably work every single time you use them! Set these traffic "machines" in motion! You'll get amazing traffic tips and secrets that will open your eyes — even if you thought you knew about the strategy, you're sure to learn something new in each module! Your traffic will build every month as you discover and deploy these strategies. You may not believe what your traffic logs will tell you a year from now! Your traffic will grow exponentially due to the synergistic effects of combining these methods — together they're more powerful than when used alone! It's like getting a PhD in traffic generation. Dale Earnhardt Jr. would have won that race if he would have had enough fuel. You can win at getting massive amounts of FREE traffic to your website by putting Traffic Storm strategies to work for you. I developed Traffic Storm so YOU can discover how to get completely free traffic to your website—and plenty of it! You saw the video showing how much free traffic this site gets. Almost 1 million visitors in 4 months doesn't happen by accident—and ALL of that traffic was FREE! 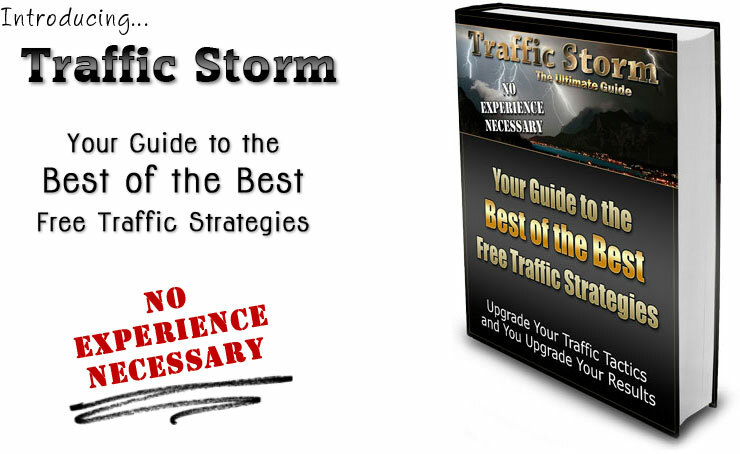 A Traffic Storm module averages around 40 pages. Each one is a stand-alone, step-by-step "blueprint" that shows you a free traffic strategy you can start using right away. My all-time best way to get traffic anytime I want it! I've listed each module below. You can buy them individually or grab them all at a steep discount. Some come with nice bonus products, and there are additional bonus products included with the purchase of the entire package. How to find a ton of popular blogs you can "borrow" traffic from. A 5-step system for getting bloggers to permanently promote you to their readers. How to write a guest blog post that builds anticipation and gets readers to click through to visit your site. Examples and ideas for everything from start to finish - you'll not only discover WHAT to do, but HOW to do it, too. It makes little sense to write an article and just use it once when you can strategically re-use your articles to drive traffic to your site. In this 43-page module you'll discover 27 different ways to re-use your articles—imagine how much more traffic that means! Bonus: This module includes a 25-page special report that reveals my secrets for writing more effective articles. Includes insider tips, article anatomy, title formulas and examples, and the all important "Final Point" that determines if readers follow the link to your site. In this 57-page module you'll discover one of my favorite ways to make money, get new subscribers for your mailing list, and drive traffic to your site. The beauty of this method is that you can do all three of those things simply by giving away rebrandable reports. Giving away information other people already want is easy! Did I mention others will give away your free report too? It's true, others will be glad to help promote you with this ingenius strategy. If you create your own products, or if you are thinking about it, this 39-page module is for you. Inside you'll discover how to do a product launch, from recruiting partners to generating a buzz for your product—you'll see how the pros do it so you can too. The last few pages are dedicated to increasing your income after the launch. No sense in not maximizing your income, right? I'm not psychic, but I may know what you're thinking! Bring up "press releases" to most webmasters and they immediately think they don't have anything newsworthy to release. Not only are they usually wrong, but even if they're right they can create newsworthy items and events. There's a serious amount of traffic available with a good press release. Bonus: The main module is about traditional press releases, but I include a 19-page bonus report about online press releases. In this 41-page module you'll discover how to develop your overall plan, the ten best types of videos to make, how to create your videos, how to distribute your videos, and how to set them up so they get traffic. Bonus: This module comes with two great bonus items. First, everyone had heard of YouTube, but I've included a list of over 50 other video sharing sites to maximize your traffic. This 41-page module details how to create "slide-show" style videos that you give away for free. The free video whets the viewer's appetite for more, and then leads them to your paid product for that something more. Bonus: This module comes with same two great bonus items included in Module 6. In this 44-page module you'll discover how to create Master Resale Rights (MRR) reports that can drive crazy traffic to your site. MRR means that those you sell the product to can themselves sell it to others, and those they sell to can sell it, and so forth. Because you'll have links to whatever you want to promote inside the report: a product, an affiliate product, your website, your mailing list, whatever! Since those who buy it can sell it, they have a great incentive to do so, and they'll ALL be promoting YOU when they do! This one is only for those with their own product to sell. In this 24-page module you'll discover how to take on an affiliate manager who will recruit affiliates and promote your product for you. This is done on a commission basis, so you don't have to pay them up front. Inside these pages you'll discover the 5 keys to finding an affiliate manager and the 5 keys to working with an affiliate manager. A short interview with a successful former affiliate manager is included. This 41-page module details how to get free traffic by creating your own small "giveaway" events. By creating your own event, you can avoid the usual negative aspects of it. For example, most giveaway events draw "hit and run" freebie seekers, but you'll know how to keep these folks engaged and looking forward to your emails. This module is different. All the other modules are 100% free all the way. Self-liquidating offers require you to spend some money on Adwords, but it's money you earn back AND you'll have a mailing list composed of buyers in the end, who will often buy more from you. This 34-page module shows you everything: choosing a topic, creating your report, titles, pricing, setting up your campaign, keywords, back-end sales, mailing lists and more. This 66-page module is about content syndication, not link building, although links happen as a natural byproduct. This is a little different in that it's a 31-day step-by-step plan. This module details how to write different kinds of articles, and it breaks them down so you understand each part of each article type. You could say this is the "science of article writing," except unlike science, everything is explained in simple terms so anyone can undertand it and become an master article writer. What is just ONE good customer worth to you? Let's say you sell or promote a $50 product. That means each customer is worth $50 to you up front. The lifetime value of each customer could be hundreds of dollars as they buy other products from you. Figure that out, and you'll understand the true value of this course! As described above, some of the modules come with their own bonuses. The bonuses below are ONLY included if you purchase the full Traffic Storm series. This video course (6 videos) sells for $17 by itself elsewhere on this site, but it's yours for free with the purchase of the entire Traffic Storm package. In the course you'll see how to create simple videos using free software. I didn't create this course, I bought the rights to it, so you'll see video marketing from a different perspective than I offer in modules 6 and 7. If you're not using videos in your traffic generation efforts you're at a serious disadvantage. What really bites is that you don't have to be at a disadvantage because all this "video stuff" is easier than most people realize. The subject matter of this bonus may sound boring, but it's not. Trust me on that. It will help you create better content. Better content means more people will link to it and share it on social media sites like Facebook, Twitter, Digg and others. This product also sells for $17 elsewhere on this site, and I've sold a lot of copies. A LOT of copies! It's yours for FREE with the purchase of the full Traffic Storm series. This video course includes 9 videos that show you how to make some cool graphics using free software. I thought it would be a nice bonus for you to be able to make your own graphics for module 7. This product sells separately for $17 on one of my other sites. Inside the members area for this you'll also find about 500 free starter graphics (blank buttons, banners, and headers). If I add more modules to this course - and I may because that means I would likely sell more - you'll get them for free. Additionally, you'll get any available updates of any of the modules for free. Sometimes on my comprehensive products like this I like to add a mystery bonus. I can't tell you what it is or it wouldn't be a mystery, but I can tell there will be a little something extra in the package. I'm so sure you're going to be delighted with the quality of Traffic Storm I'm offering an unconditional 30-Day Guarantee. If for any reason you're not satisfied with the quality just let me know and I'll give you a full refund. Get Just the Modules You Want or Get the Full Set at a Serious Discount! You can order the individual modules below, but first, you owe it to yourself to scroll down and see the price for the full Traffic Storm series. You might be pleasantly surprised. Reminder: You'll save a small fortune when you buy the full package. See below for details. Purchased separately the 12 Traffic Storm modules would cost $217. If you purchase the full package today, you can "steal" it from me for just $47!! The in-module bonus items and the extra bonus items that come with the full package are easily worth another $100—and you still get it all for just $47 if you order now. Be aware that this price may not last. Order today while you can still get everything for one super-low, one-time investment. Do you want trafffic to your web site? Traffic Storm is how it's done! Yes, this looks great! A chance to discover how to drive traffic to my site from a site owner who gets a few million visitors a year is a fantastic opportunity—and a great bargain at just $47. I understand this is a one-time investment. Instant Download - Paypal should redirect you to the download page upon completion of your order. If your browser prevents that, click the "return to merchant" link to go to the download page. Important: If your browser settings prevents you from being redirected to the download page after your order goes through, just click the "return to merchant" link to go to the download page. If you have any problems just send me an email. You may never get another chance to learn how to generate traffic to your website from someone who owns a site that gets millions of visitors per year. You online success is tied directly to the number of visitors to your site. Don't leave it up to chance—take charge of your future today! This is it.